Years back I owned a picture the size of one-third a regular postcard, of magnificent trees standing majestically tall on a grassy slope. In the white rectangular space beneath the picture was written in black letters some inspiring quote or other. Unlike the world at large, I abhor *inspirational* quotes, and so have forgotten what it said, but the picture is as fresh as ever in my mind. I was fourteen and this had been my favorite picture in my collection. I often took it out of my desk at the boarding school and gazed at it longingly, wishing with all my heart that I were lolling in the sunlight dappled shade beneath the trees with a book of my choice. Who needs heaven when you have trees and books (and music)? Not me. It seems rather funny to me when I think of it now, a fourteen year old collecting pictures. I bet no one of the same age does that in the present. Oh no, don’t take this as an onslaught on the present generation, the typical ‘we were so innocent unlike the teens of today’ type of talk. That’s nothing but Grade A bullsh*t that every generation says of the next because they think, foolishly so, that this somehow automatically makes them appear *older* and *wiser*. Nothing could be further from the truth. It only makes them seem like parrots, mindlessly parroting the same old tripe their previous generation said. Omigosh, I have digressed and how! Getting back, it is no secret that I love trees a lot, quite a LOT. The introduction about the picture I owned had been to establish that my love for trees goes way back and hence how very much I was looking forward to visiting the botanical gardens at Peradeniya, Kandy.. I know it has been awhile since I wrote my last post about the Sri Lankan trip [you can refresh your memory here]. Last seen, my friends and I were settling down for the night at a hotel in Kandy at the end of our first day. The fourth member of the group who had missed the flight reached late night that same night. So the next morning saw the foursome checking out of the hotel after partaking a sumptuous breakfast, eager to take on what the day had to offer. The same evening we would be leaving for our next destination. But, little did we know at the time that we’d be returning to the same hotel later that day to recover something we had inadvertently left behind. When our vehicle pulled up at the gate of the Royal Botanical Gardens at Peradeniya, there were many more lining up to visit this, Sri Lanka’s largest gardens, spread over a spacious 147-acres (60-hectares). Foolishly I brushed aside the chance to see it in one of those cute little vehicles and opted to do it on foot. Anyways, when foolish decisions are made without taking into consideration your own shortcomings, one has to simply grin and bear it, which is what I do always, and which is what I did that day too. The surroundings helped, the grand trees and the awesome feeling one gets while walking beneath them, not to mention the beauty of the well laid garden with its trimmed hedges, beautiful bushes and flowering plants. My feet screamed in protest as we walked and walked and walked (the guide told us it is a 7 km walk, we surely must have walked at least 5 kms that day). There were no benches around (why, oh why?) to rest one’s tired feet. Finally we managed to find a place to sit and rest for a while before I dragged my feet to the exit along with my friends. It was already lunchtime and on reaching the restaurant my heart sank. It was on the second floor and there was, yeah you guessed it, no lift. One had to eat, so there was no way out but climb all those steps. Once lunch was over I dragged myself downstairs, all the time dreading the next stop, the Temple of the Sacred Tooth Relic. Prem, our guide had said (Yup, I checked with him the previous day) to my dismay that there were around fifty steps to climb to reach the temple. Imagine my relief when it turned out what he had actually said was ‘fifteen’ and not ‘fifty’! This put me in such a state of cheerfulness that I did something foolish, I decided to take my chance (instead of wisely staying back) took off my shoes as required in temples and went in barefoot. But that came later, before that there was the duck. 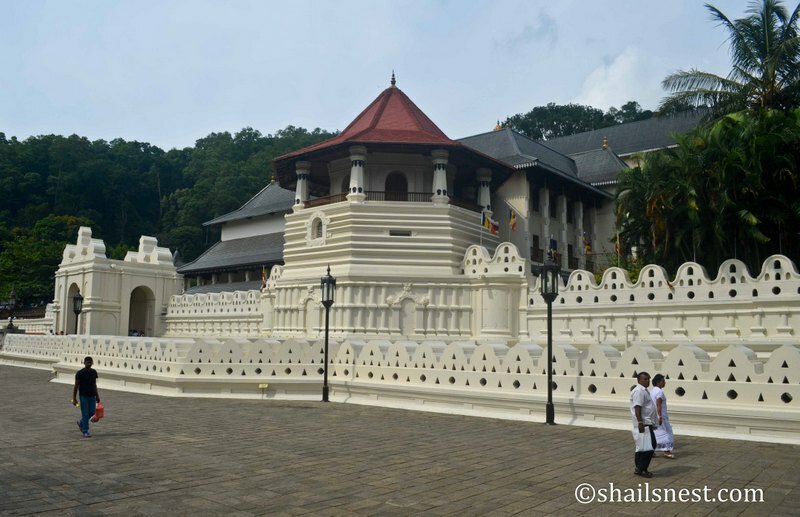 Sri Dalada Maligawa or the Temple of the Sacred Tooth Relic is a Buddhist temple located in the royal palace complex of the former Kingdom of Kandy and houses the relic of the tooth of the Buddha. So, I climbed those ‘fifteen’ steps and walked around minus my shoes inside the temple. We saw the shrine below, the place where the tooth was kept in safe custody, the worshipers with their lotus offerings, huge statues of Buddha, lamps being lit in thanks for wishes granted et al. I felt an intruder walking as a tourist among those who were deep in prayer or chanting, and taking pictures too. If you won’t clobber me, I’d like to ask a couple of questions. Why worship a tooth, even though it belonged to a man you consider God? Isn’t this sort of worshiping against the very tenets he taught? One more, how do you know it really belongs to the Buddha? Let me clarify, I have no issues with anyone worshiping anything. It is entirely up to people how they lead their life. But I can wonder, can I not? At the exit, my heart sank for a second time that day. The path I had to use to walk back to the entrance consisted of big uneven stones. It was painful walking, yes. But there was nothing else to do but grin and bear it, but of course. Our guide was getting restless. It was already getting dark. We had a long drive ahead of us and it was all uphill too. While we were signing the receipt and getting the sweater (yes the hotel had kept it safe), he honked impatiently. “Hurry!” he said. “Long way to go and the traffic is going to be terrible at this time of the day!” So off we went, on our way to the next destination, Nuwara Eliya. A forgotten sweater to prevent being brr-ed! You remember so much, Shail! Even after writing down in a diary, I don’t remember so many things in such detail! I too enjoyed the Botanical garden. The dance drama was just OK. The tooth temple didn’t impress me much. And I was not happy looking at so many elephant tusks inside the temple. I can never forget this photo of yours, of the duck coming after me! Enjoyed revisiting these places again! Loved the video at the end – so much in those five minutes! The video was fun. You packed in so much in those 5 minutes for us. Thanks, Shail. We couldn’t catch the cultural show when we were there. Cant remember why we didnt do that though. Oh ya, now I remember.. we were dead tired after all that climb up and down the temple of the tooth relic. In fact I even remember our driver had even suggested we caught the show but we didnt have the energy. Goodness, hats off to you for all that walk and then being game for the cultural show afterwards!